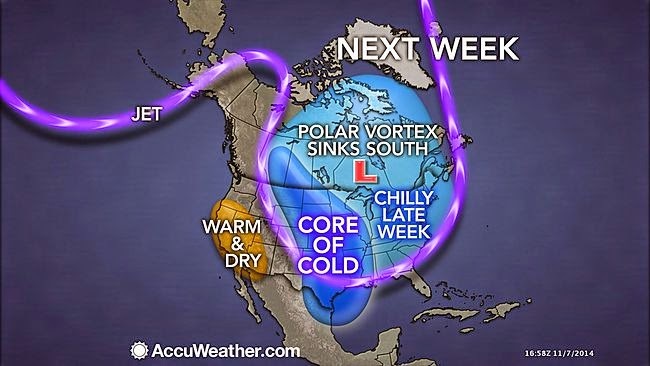 Bluegrass Pundit: Clueless: NOAA told us to not expect another polar vortex this winter. One is coming next week. Clueless: NOAA told us to not expect another polar vortex this winter. One is coming next week. These are the same people who claim that CO2 forced global warming is real. WASHINGTON — If you thought last winter was a horror show, with cold blasts from the polar vortex and a lack of California rain, here's some good news: No sequel is expected this year, federal forecasters say. Mike Halpert of the National Oceanic and Atmospheric Administration said Thursday that the upcoming winter looks pretty average in general. He doesn't expect a lot of extreme conditions like last year's cold outbreaks when Arctic air dipped south with the polar vortex. The coldest weather of the season so far will extend from the Dakotas to Texas and the Interstate-95 corridor by the end of the week. The outbreak of arctic air will be long-lasting and may linger well past the middle of the month.